Orpheus is a complete clinical video and visible light documentation solution to realize the patient-centric clinical repository. 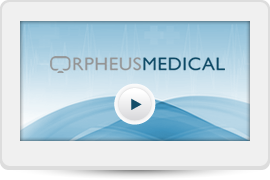 Orpheus captures, stores and broadcasts clinical video and images used in General Surgery, Urology, Gynecology, Cardiovascular surgery, Neurosurgery, Gastroenterology, ENT, Pulmonary, Pathology, Wound Care, Dermatology and other procedures. Clinical workflow tools with intra-procedure snapshots and tagging, advanced video editing, indexing and reporting ensure accurate documentation with seamless automatic sharing with the EMR and VNA. Orpheus integrates any video signal in the OR coming from scope cameras, patient monitoring systems, ultrasound or other modality devices and external devices (e.g. a light camera or head camera). 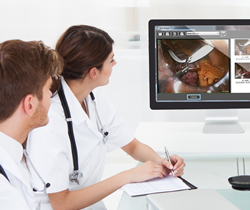 Secure mobile and PC based capture and annotation tools ensure video, images and audio files valuable to patient care are immediately available within the patient’s record whether they were taken inside or outside the hospital. Orpheus removes silos of information and workflow by providing on demand and live access to clinical video from anywhere. Localized departmental solutions and complex costly projects are eliminated while leaving no image or video behind. Evidence based case review and conferencing coupled with physician and departmental performance metrics are key elements provided by Orpheus to continuously improve quality of care and team coordination. Orpheus hands clinicians tools to collaborate, coordinate and improve patient care pre, intra- or post-procedure by providing tools for evidence based case review and conferencing. To learn more, download the Orpheus Clinical Media Solution Brochure – Extended Version. Interoperable with the hospital’s EMR and VNA viewer, clinicians are literally a click away from having full visibility of the patient’s clinical video and visible light imaging data. The vendor agnostic capabilities of Orpheus enables hospitals to control capital expense removing the need to replace or implement costly solutions.